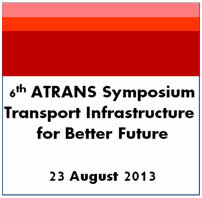 We are pleased to announce that Asian Transportation Research Society or ATRANS in short is organizing the 6th ATRANS Symposium on “Transportation for A Better Life: Infrastructure Development & Management Aspects" which will be taken place on 23rd August 2013 at the Imperial Queen’s Park Hotel, Sukhumvit 22, Bangkok, Thailand. We are also pleased to inform that “ATRANS Young Researcher’s Forum” (former name was student chapter session), an attached program of ATRANS Symposium is now open for CALL FOR PAPERS. Authors of accepted papers to be presenting in the 6th ATRANS Symposium: Young Researcher’s Forum 2013 by the Scientific Committee can request for financial support such as transportation and hotel accommodation. The essay / drawing that plans to submit should not have been submitted in any other contests before. The essay / drawing must be written or drew on a white A4 paper. *** Duration of submitting essay / drawing works is between 1 June – 15 July 2013. The results will be announced on 29 July 2013. The award ceremony will take place on August 23rd, 2013 in the 6th ATRANS Symposium at Imperial Queen’s Park hotel, Sukhumvit 22, Bangkok.